I have a new article up at Common-place, exploring the history of enslaved artisans like Pompe Stevens. The main argument is that modern museums (particularly those in Northern cities like New York, Philadelphia, and Boston) can expand their interpretation of early African-American art by re-contextualizing decorative arts objects that were made in workshops that employed skilled slaves. 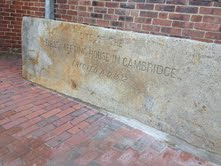 Last week, the Cambridge Historical Commission re-installed a long-lost granite marker at the location of Cambridge's first meeting house. The marker was discovered during some construction and returned to its place near the corner of Dunster and Mt. Auburn Streets. I visited the spot a couple of days ago and took the opportunity to reflect on the distance between the meeting house and Cambridge's old burying ground. Unlike graveyards in England, which were formally consecrated ground and usually located immediately adjacent to a church (hence the term "churchyard"), the burying grounds of early Massachusetts were neither formally sacred nor adjacent to a meeting houses. Prior to 1670, most burying grounds were separated from local meeting houses by a distance of a quarter mile or more. That might not seem like a considerable distance, but in the context of early settlements, it was a real separation. You can see the distance on this 1635 map of Cambridge — the "Burying Place" is in the upper left corner, the meeting house is near the middle of the settlement, at the corner of Spring and Water Streets, marked MH. As you can see, the distance is quite significant relative to the overall pattern of settlement. The creation of geographical distance was just one of the ways that the emigrant generation overturned the legal and doctrinal traditions governing graveyards in England. Massachusetts "burying places" were really burying places, not churchyards in any sense of the word. But, if you visit Cambridge's old burying ground today, you could be forgiven for seeing it as a churchyard. After all, it is flanked on one side by Christ Church and on the other by the First Parish Church of Cambridge. It is important to note that the landscape as it exists today is a creation of the 18th and 19th centuries, not the 17th century. The following map shows the development of the modern landscape. 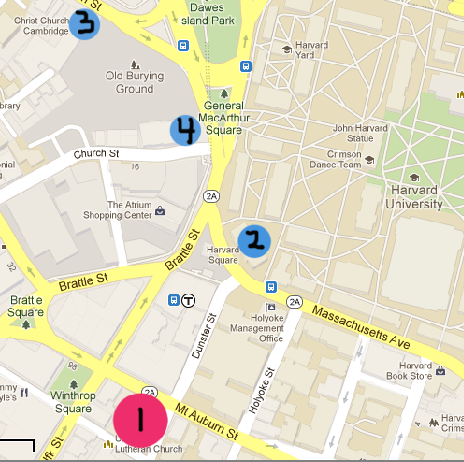 "The Old Burying Ground" is clearly marked in the upper left, just across Mass Ave from the oldest part of Harvard Yard. The red circle marked "1" indicates the location of the original meeting house, built in 1632. In 1652, a new meeting house was erected at the site of modern-day Lehman Hall, at the elbow of Mass Ave (the blue circle marked "2"). It was closer to the burying place, but still not quite enough to make a churchyard. In 1759, the Church of England built Christ Church adjacent to the burying place. In doing so, they created a churchyard, not by burying people near a church, but by dropping a church on a pre-existing graveyard. This is exactly what happened in Boston in 1686, when Governor Edmund Andros seized a corner of the Ancient Burying Ground in order to build King's Chapel. If you have ever wondered why on earth John Winthrop and John Cotton are buried next to the flagship Anglican church in colonial Massachusetts, that's why. They were long dead and long buried when King's Chapel was built. In my dissertation, I argue that Andros deliberately chose the burying ground over several other possible sites as an affront to Congregationalist Bostonians who objected to the of building King's Chapel anywhere in Boston. 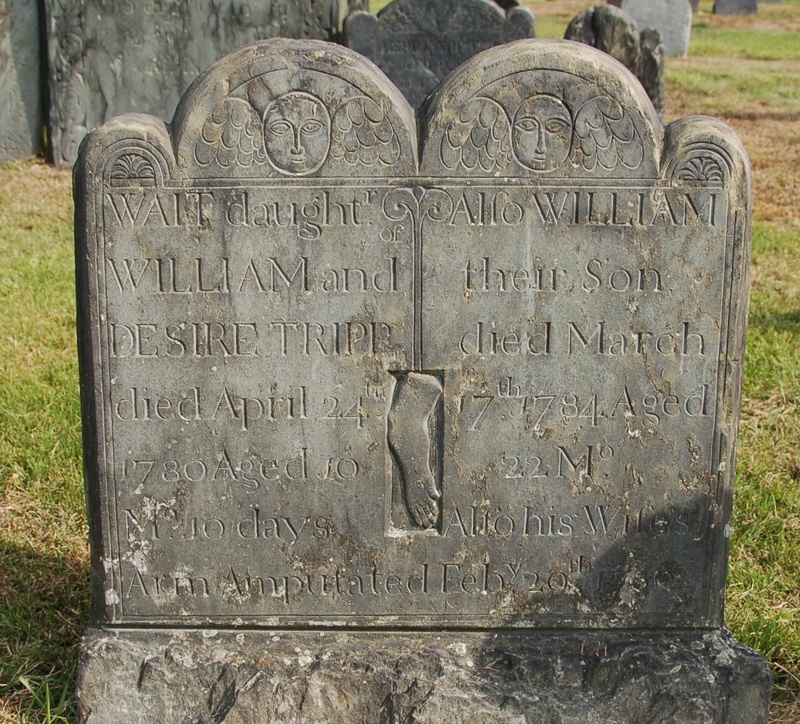 Samuel Sewall, who had inherited some of John Cotton's original homestead refused to sell Andros a tract of that land, arguing that it would have been an affront to Cotton, so Andros dropped the church on Cotton's grave instead. Charming. The blue circle marked "4" is the current location of the First Parish in Cambridge (now Unitarian Universalist). It was built in 1833 and reinforced the illusion that the old burying ground had been built as a churchyard. All of this is a long way to say that historic landscapes change over time. The "preserved" landscapes we encounter in the present day are vastly different from past landscapes. In this case, the modern appearance of Cambridge's old burying ground masks the original reforms enacted by the emigrant generation and creates the very thing they undid — a churchyard. he was born the 5th, Octr. 1791.
he took his exit 24th, Novr, 1792. How blest the babe, consign'd to parent earth. Speaks the sad sorrows of a mothers breast. Say, does religion blame the gentle tear? Can reason condemn the heartfelt sigh of woe? Wept o're his friends nor chek'd afflictions flow. As far as I can tell, the verse is original.